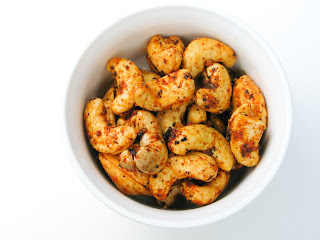 This recipe for chilli roasted cashew nuts is the perfect snack for munching on new year's day while watching a Hollywood classic (I suggest Casablanca or All About Eve) and nursing a hangover. The crunchiness of the cashews combine with the salt and spice to create a full flavoured snack that is scarily addictive. Be warned - the recipe below is hot. If you have an aversion to your mouth burning (in a good way) then reduce the quantities of chilli and black pepper. Wishing you and your families a healthy, peaceful and happy 2010. Pre-heat the oven to 160 degrees centigrade. Distribute the cashew nuts evenly on a baking tray. Roast the cashews for 8 minutes. In a large mixing bowl place the oil, salt, black pepper and chilli powder. Mix well to create a paste. When the cashews are ready, add them to the mixing bowl and stir well to ensure they are all fully coated in the paste. Now return them to the baking tray and roast for a further 2 minutes. Let the cashews cool as they will have a slightly soft texture if eaten when warm. Serve with beer (or cocktails for the more sophisticated). Note: These nuts can be stored in an airtight container for up to two weeks. Thanks for the wonderful idea. Just got a pack of cashews from my sis. Curse you. I have exactly 100g of cashews and exactly 0g of will power. Also, this was exactly 100g of deliciousness! These look like a great snack! I love spicy snacks, and these do sound great with a cold beer! I don't have oven! How can heat 160 degree ? Have other ways?